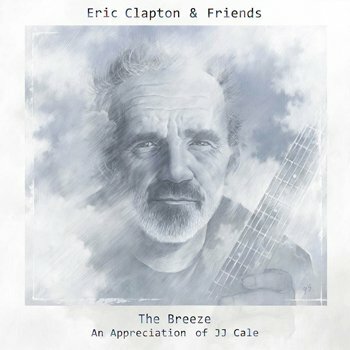 Eric Clapton has put together an album celebrating the life of JJ Cale, who sadly passed away a year ago on July 26th 2013. Eric came up with the idea on the flight to JJ’s funeral, and enlisted friends Tom Petty, Mark Knopfler, John Mayer, Willie Nelson, Albert Lee, Derek Trucks and Don White to play on the album. JJ Cale is credited with creating ‘the Tusla sound’ and his body of work includes Clapton’s hits ‘After Midnight’ and ‘Cocaine’. The two collaborated on The Road to Escondido in 2006 and JJ joined Eric on ‘Angel’ for his 2013 album, Old Sock. Eric feels that JJ hasn’t received the recognition he deserved and hopes that The Breeze will draw global attention to his talent. You can order the album by clicking here. Left: Genesis’ Catherine Roylance designed the album artwork, which features an illustration by Yoshiyuki Sadamoto based on Michael Putland’s photograph.